Paefgen took over Bentley after being replaced as the Audi chief by VW CEO Martin Winterkorn. BERLIN (Bloomberg) -- Volkswagen AG plans to install a Porsche manager as CEO of its ultraluxury Bentley brand, according to people with direct knowledge of the matter. Wolfgang Duerheimer, Porsche's development chief, may succeed Franz-Josef Paefgen as head of Bentley Motors Ltd., said two people, who asked not to be identified because the discussions are confidential. Duerheimer, 52, is currently Porsche's board member responsible for research and development. He is the favored candidate to replace Paefgen, 64, who is set to retire, the people said. A final decision hasn't been made, they said. Fred Baerbock, a VW spokesman declined to comment, citing company policy. Bentley and Porsche spokesmen also declined to comment. It's unclear whether Duerheimer would assume Paefgen's dual role as CEO of Bentley and Bugatti, both part of VW's super-luxury brands that also includes Lamborghini SpA, according to the people. Duerheimer's position at Porsche may be filled by Wolfgang Hatz, head of engine development at VW, people familiar with the matter said June 18. The new CEO will need to turn around Bentley's fortunes as customers have fled the carmaker's aging models such as the Continental, which starts in the U.S. at $177,600. Bentley's sales plunged 50 percent to 4,000 vehicles last year. 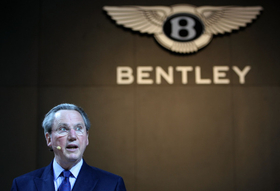 Crewe, England-based Bentley posted a 2009 operating loss of 194 million euros ($237 million), compared with a profit of 10 million euros a year earlier. The only other VW car unit to report a loss last year was the Spanish Seat brand. At the time of the purchase of the brand in 1998, Volkswagen invested 500 million pounds ($745 million) in the Crewe factory to upgrade the facilities and expand production. Bentley, which builds cars by hand, takes 150 work hours to assemble a Continental GT and 400 hours to build an Arnage, according to its Web site. Bentley, which also makes the Brooklands Coupe and Azure convertible, as recently as 2007 sold more than 10,000 vehicles and posted an operating profit of 150 million euros, according to its website. The U.K. carmaker, which was founded in 1919, employs 4,000 people. Paefgen took over Bentley after being replaced as the Audi chief in March 2002 by VW CEO Martin Winterkorn. The change is part of an extensive reorganization of managers at its luxury brands as part of a merger with Porsche AG. Porsche CEO Michael Macht is the preferred candidate to run production at VW, people familiar with the matter told Bloomberg News on June 18. The reorganization underscores Volkswagen's aim of putting executives with product-development experience in charge of its luxury brands. Porsche shares rose 5.5 percent Monday on optimism VW will name Matthias Mueller, its chief product strategist, to succeed Macht as chief executive. Volkswagen, which aims to overtake Toyota Motor Corp. by deliveries and profitability in 2018, is integrating Porsche as the carmakers develop a model strategy that includes sharing platforms. As part of the plan, Stuttgart, Germany-based Porsche aims to expand its lineup to reach a target of doubling deliveries to 150,000 vehicles in the medium term.